I’ve never paid too much care for where my rockets fall in Kerbal Space Program. Sure, what comes up must come down but, so long as it doesn’t fall on my crew as they fly into space, I’m good. Update 0.25, otherwise known as Economic Boom, changes all that by placing your space program facilities onto the surface of Kerbin. If you’re not careful your falling fuel booster can take out the top floor of your administrative building and 20 unpaid interns with it. Think of the paperwork! 0.25 is the first of Squad’s smaller, more focused updates. The shift from larger updates means we’ll be seeing much more frequent releases. 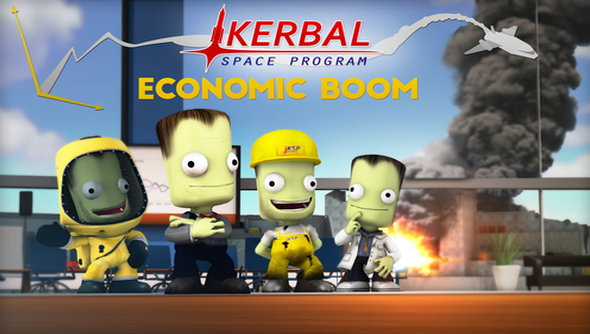 Economic Boom isn’t just about explodable buildings (though, explosions do now look better, too), it adds a whole new metalayer to your space program. This layer comes in the form of Strategies. From the new Administration Facility you can activate strategies, like Aggressive Negotiations which lets you buy rocket parts at a discount but each discounted purchase lowers your program’s reputation. And, with a low reputation you can’t attract interns of the unpaid variety. Each strategy plays off your three major resources, funds, reputation, and science, so you’ll frequently switch between strategies to recoup one resource at the cost of another. The team have also incorporated Christopher “PorkJet” Thuersam’s SpacePlane+ mod into the core game. That means better looking parts and new gear to build ship types beyond just rockets. The Economic Boom update’s already been released so your copy on Steam should have already updated. You can find a lot more details in the update 0.25 FAQ.